How much thought do you give to your stair rails? If you are brutally honest with yourself, the answer is probably that you don’t think of them at all. That’s okay; most people do not. However, stair railings are an important feature in your home. Even though they are generally ignored, they can quietly have a large impact. If you are skeptical, here are six ways stair rail finishing improves a home. Naturally, you want your home to look as good as it can. One way to improve the overall appearance of your house is to refinish your stair railings. Stairways are not often thought about when homeowners consider home repair, which is a mistake. Neglecting the appearance of stair rails can result in wood that becomes faded and unattractive over time. A simple coat of finish can brighten up a stair rail that is used every day but is often overlooked. Improving the appearance of your stair rail will most certainly create a look that is worthy of the rest of your home. Not only will refinishing your stair rails make them beautiful, but it will also help their appearance last longer. Stair railings that are in a state of disrepair will continue to deteriorate over time. The result is an ugly stairway that is unappealing and will eventually become a useless eyesore. However, if you take the time to finish your wood stair railings not only will they look better, they will look good for an extended period of time. So, even though there is an immediate output of time that must be taken to make them look their best, one small job can last for an untold length of time. Home improvement projects such as room enlargements and new floor installations are great options for making the house look its best. Projects of this nature often require lots of time and a significant amount of money. However, the payoff is worth it. Few homeowners are ever dissatisfied with the finished product after a home improvement project. Going through a home improvement project and neglecting to refinish stair railings is a mistake because, despite the time and money that was spent, the finished project is imperfect without it. Plus, old and faded stair railings look older and more worn when they are compared to brand new updates. By taking the time to refinish your railings, they will blend in with any other updates. Further, finishing your railings gives you the option to change their shade so they complement the new design instead of sticking out like a sore thumb. If you have had your stairway look the same for several years, it might need an update. It is virtually impossible to change the configuration of the stairs without an immense expense attached. However, you can easily update the stair railings by refinishing them. Choosing a different shade can liven up the area and give it a completely new look. You can easily take a dated style and color that was perfectly fine when you moved in and transform it into something fresh and modern. You will be surprised at how much a simple task like refinishing the stair rail can make your home look like new. Refinishing your stair rails provide untold benefits for prospective home buyers. 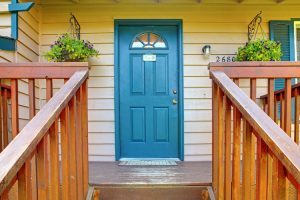 If you are trying to sell your home and the railings look faded and neglected, they can easily give the impression that there might be issues in other areas of the home that were also overlooked. Conversely, a refinished stair rail not only looks better and automatically increases the likelihood that someone will be interested in purchasing the home, but it can also give potential buyers confidence that the rest of the home is updated and not in need of significant repairs. All homeowners understand the importance of the resale value of their home. Even if you do not intend to sell your home in the near future, an increased resale value is always beneficial. The resale value of your home affects the property values of the other homes in the neighborhood. Resale value is also used as collateral if you are seeking a loan. Improving the appearance of your home’s interior by finishing your wood railings can truly make your house more of a financial asset than it would be if you just left them alone. If you are ready to take the plunge and improve your home by refinishing your stair railings, you need to call Flortec. Our talented and experienced staff can transform your old stair railings into virtual pieces of artwork.